LaGuardia Airport LGA is situated in the City of New York, Borough of Queens, and is one of the Airports operated by The Port Authority of New York and New Jersey. It is located on the Flushing and Bowery Bays, eight miles from midtown Manhattan. 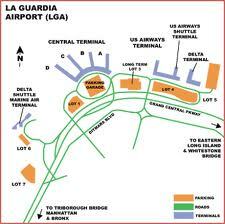 LGA airport is the main domestic airport of New York City. A perimeter rule prohibits incoming and outgoing flights that exceed 1,500 miles, so most transcontinental and international flights use the other major New York area airports, JFK Airport or Newark Liberty Airport. However, LaGuardia is still served by many airlines offering nonstop daily flights to numerous destinations in the U.S. and Canada, as well as seasonal flights to the Bahamas and Bermuda.